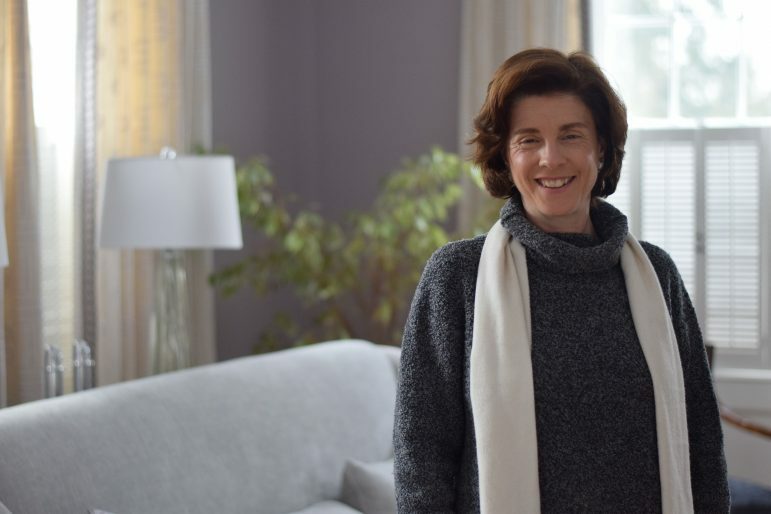 When President Maud Mandel and her family moved into the President’s House on July 1, Williamstown was going through a heat wave, with temperatures climbing into the mid-90s. To make matters worse, the house’s air conditioning was broken. The President’s House, historically known as the Sloan House, has served College presidents and their families since 1858. Today, three people live in the house: Mandel; her husband, Steve Simon; and their daughter, Ava. Also residing there are feline siblings Shoshie (short for Shoshanna) and Ishie (short for Ishmael). Shortly after Mandel and I sat down, Shoshie climbed onto her owner’s lap, where she would stay for the rest of the interview. When Mandel took office last year, the house had not been inhabited, by people or by cats, for several years. Although Adam Falk, Mandel’s predecessor, resided in the house near the beginning of his presidency, he spent the last years of his tenure in a private house off campus. Falk’s decision to live elsewhere was far from unprecedented in recent history. Hank Payne, who served as president between 1994–1999, moved off campus because he did not like living in the house, according to Professor Emeritus of Art E. J. Johnson, who co-authored Williams College: The Campus Guide with Professor of Art Michael Lewis. The house was not occupied again until Morty Schapiro assumed office in 2000. But for Mandel, living in the President’s House was an obvious choice. She also delights in the central location of the house. Also, her commute, which was a half-hour drive when she was dean of the college at Brown, is now only a seconds-long walk to Hopkins Hall. Yet another factor in her decision to live in the President’s House was its recent renovation. After Falk left the College, the Board of Trustees decided to renovate the house. “A lot of the structural issues that made it difficult for the Falks to live here were addressed in the renovations, so it’s really a wonderful place to live,” Mandel said. She identified the introduction of overhead electricity as the most significant improvement. Previously, the house had access to electricity but no lights in the ceiling, and a gloomy atmosphere prevailed. Now, the spacious, high-ceilinged rooms on the first floor all sport elegant light fixtures. With a house newly suited to entertaining, Mandel hosts a wide variety of events. Events for students have included a kickoff for first-years in the tent outside the house, a gathering in early September for first-generation College students, trick-or-treating for Halloween visitors and a celebration for the national championship-winning women’s soccer team. Mandel also hosts dinners for faculty, staff and trustees. She said she hopes to have all faculty members come to dinner over the course of the next few years. The house comprises not just space for entertaining but also private living quarters for the family. In one room on the first floor, two teddy bears clad in University of Michigan T-shirts sit on a shelf, and resting on one of the couches is a blanket with “President Mandel” stitched on it – a gift from Mandel’s cousin. The walls in the rest of the first-floor rooms are adorned with art from WCMA, chosen by a decorator. While much of the furniture is modern, some pieces are College-owned antiques. One such item is a pink, 1920s reclining couch in the living room. “I think it belonged to one arm of the Rockefeller family at one point,” Mandel said. With its contemporary art, antique furniture and neoclassical architecture, the house reflects an eclectic mix of time periods. Designed by an unknown architect, it was built in 1801 for Samuel Sloan, a wealthy settler, according to Williams College: The Campus Guide. In 1858, Nathan Jackson, a relative of Ephraim Williams, donated the house to the College. The house’s elegant, elongated exterior is typical of Federal-style architecture, an American variety of neoclassicism, Johnson said. He believes that the distinctive intricate facade was carved in Salem, Mass. Two centuries later, the architecture still impresses. Towards the end of our interview, Mandel extolled the graceful white arch in the hallway near the front door.